The very successful program, KinderFlute Academy is an ongoing series of fun-filled and engaging music classes and lessons, designed for children ages 4-8, by Certified Kinderflute™ Instructor and owner of the Fluteplace of Central PA, Molly Shortridge. A brand new series of KinderFlute Classes will open in the fall of 2018 at the Perfect 5th Musical Arts Center on Wednesdays at 4:30 PM. To see if your child would be interested in joining the program and learning to play the flute, sign up for this free introductory classes, where you can also receive more information on the program. 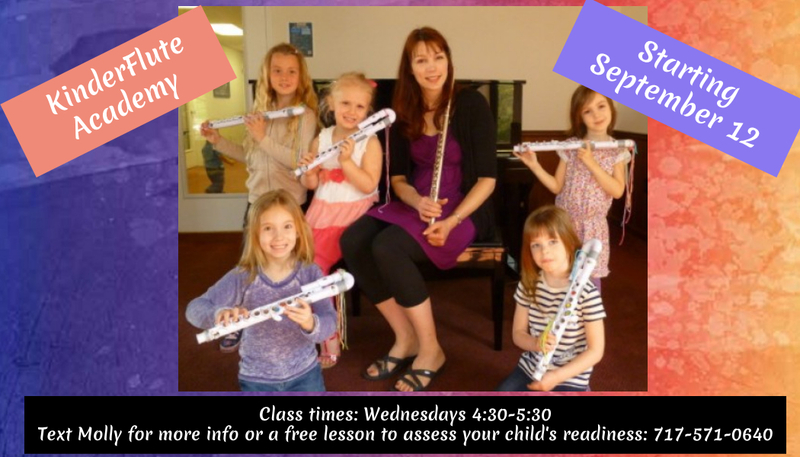 In this introductory class, children will be taught how to blow into the flute (flutes not needed at this time), and will participate in fun music activities. They will even get to hear the beauty of the instrument up close and live! Parents encouraged to observe the class. New classes are formed only once every two years, so don't miss your child's chance to be part of something that is entirely unique, nurturing, and rewarding. KinderFlute teaches kids how to play an instrument at an early age! Please visit KinderFlute™ Academy for more information on the program. Email Molly at info@theperfect5th.com if you have questions and wish to have a free lesson for your child to assess their readiness. The very successful program, KinderFlute™ Academy, is an ongoing series of music classes and lessons, designed for children ages 4-8, by Certified Kinderflute™ Instructor and owner of the Fluteplace of Central PA, Molly Shortridge. A brand new series of KinderFlute™ Classes will open in the fall of 2018 on Wednesdays from 4:30-5:30. The start date is September 12 and the classes are ongoing. Children generally attend the program for 2-3 years and then continue with lessons or lessons/ensemble combinations after that. This is the only class like this of its kind in Central PA, where students learn to play proficiently on the flute at a young age, and in a very fun and engaging way. Classes are jammed packed with energetic music activities and flute-learning skills. Games are incorporated into each class, which help your child learn quickly. Expect your child to leave each class smiling and excited to come back! Molly’s nurturing and warm manner encourages each child to learn at their own pace, and her observation skills and techniques aim to bring out the best in each child’s playing. Each student attends a one-hour Wednesday class, plus one 30-minute private lesson each week to hone in on individual flute skills. These private lessons are scheduled individually with Molly Shortridge at any time that is convenient for the student. Classes ($12.50 per class) are to be paid at the beginning of each semester. Individual lessons are paid monthly. A few materials will need to be purchased at the initial onset of joining, and flutes are available for purchase or rental at a low price.